I'm not going to lie to you, Marge: I'm pretty damn excited for w00tstock next week. It's one of those things where it simultaneously feels like years and seconds ago that Paul (of Paul and Storm) called me and said something like, "do you want to do a show together?" "Wouldn't it be awesome if we got Adam Savage to be in the show with us?" And just like that, w00tstock was born. The idea was to put on an evening of unique geek-friendly performances from some of your favorite geek-friendly performers, wrap it all up in a nice musical and joke-filled package, and then vanish into the night like leaves on an autumn wind. Because that wasn't cool enough, we went through our oh-so-impressive address books, and invited some truly phenomenal friends to join us as special guests, unique to each performance. I don't want to give everything (and by everything, I mean anything) away, but I've seen the setlist, and HOLY CARP. 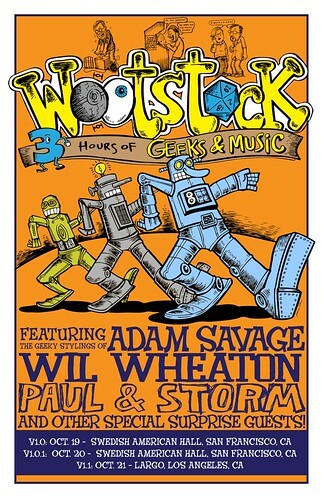 Hey, want to see the poster for w00tstock v1.0-v1.1? I know, right? Wouldn't it be great to get those robots on a T-shirt, or get a poster for your very own? Don't worry your pretty little head about it, baby, we're way ahead of you. Special Guests: sketch comedy group Kasper Hauser; singer/songwriter Molly Lewis; singer/beatboxer/game inventor/all-around creative person Kid Beyond. Special Guests: singer/songwriter Molly Lewis; singer/beatboxer/game inventor/all-around creative person Kid Beyond. Special Guests: screenwriter Josh A. Cagan (Bandslam); singer/songwriter Molly Lewis; actor Jeff Lewis (”Vork” form webseries “The Guild“); several extra-special guests that we are not allowed to name, but we swear are awesome! Night one in SF is sold out, but there are still seats available for night two. Also, there are seats still open for our show in Los Angeles, which is going to blow your frakking mind. 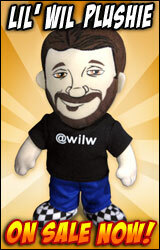 Though I don't want to give anything away, fans of The Guild will not want to miss it. Oh, how I wish I could tell you who else will be dropping in for the Los Angeles show, but we are expressly forbidden from saying or even hinting at who they are for various reasons. However, if you close your eyes and ask yourselves, "Hey, who does Wil know who lives in Los Angeles and would fit right into a geek-friendly show?" you may be able to get some ideas. I've been asked by fives of people if I'll have books for sale at these shows. Sadly, I wasn't able to get them in time, but if you have your own, and you bring it, I'll be happy to scrawl my name across it. If you have any further questions that you were afraid to ask, head to the comments and do your thing. I'll answer them as they come up. Oh, last thing: If you want w00tstock to come to your town (or at least a town that's closer to you than SF or LA) tell your friends who are in LA or SF to come see us, because if these shows do well, it will pretty much guarantee that we take this on the road next year.